The British number one defeated fourth seed Richard Gasquet in his semi-final in Morocco. 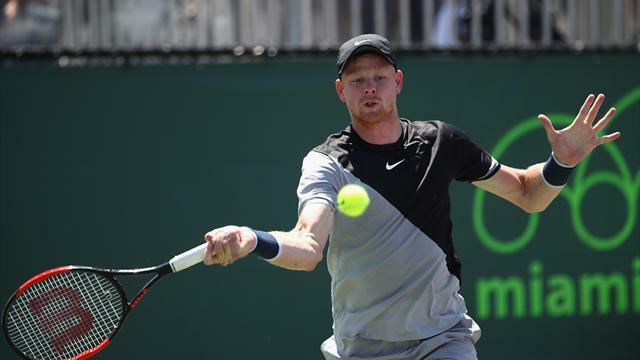 British number one Kyle Edmund is through to his first ATP World Tour final after beating Richard Gasquet in straight sets at the Grand Prix Hassan II. The Yorkshireman won two matches on Saturday in Marrakech to set up a meeting with Joao Sousa or Pablo Adujar in Sunday’s showpiece. Edmund needed just 51 minutes to see off Tunisian wildcard Marek Jaziri 6-2 6-1 in a rain-delayed last-eight clash and then beat fourth seed Gasquet 6-3 6-4 in the semi-finals. Second seed Edmund, who reached the last four of the Australian Open in January but had never reached an ATP final, made light work of Jaziri in a match carried over from Friday because of the weather. The quarter-final was going with serve at 3-2, but Edmund secured back-to-back breaks to end Jaziri’s resistance. Edmund dropped only seven points in the second set as he quickly wrapped up victory. The 23-year-old returned in the evening to face Gasquet after the Frenchman had booked his place in the last four with a 6-2 7-6 (7/4) win over compatriot Gilles Simon. Gasquet immediately broke back after losing his first service game, but Edmund broke again before serving out the set. Both players gave up games on their serve before Edmund secured the vital break at 4-4 and reached his maiden final at the sixth attempt with a love game. At the Men’s Clay Court Championship in Houston, compatriots Steve Johnson and Tennys Sandgren will come face-to-face in the final. Johnson survived dropping the second set to beat 20-year-old Taylor Fritz 7-5 6-7 (4/7) 6-2 in the semi-final, after nearly two-and-a-half hours on court. Sandgren, meanwhile, beat 39-year-old Ivo Karlovic 7-6 (7/2) 7-6 (7/4), exchanging breaks of serve to finish both sets on a tiebreak. Johnson and Sandgren are slated to meet for the first time in just the second all-American final at the tournament in the past 15 years.